Part of my job is to make sure I know what I’m talking about (most of the time), so I do a lot of research online before I write. If you look at the statistics for web browser usage, the Google Chrome web browser usage is continuing to rise at an alarming rate. I’m surprised Microsoft hasn’t done more to prevent Google Chrome being used by the vast majority of the world by roughly 2020 because they do have a few tricks up their sleeve that they could use, much like Google does use to get Google Chrome to be so popular. What does Google do to make the Google Chrome web browser so popular you ask? I’m glad you did because I enjoy exposing other people’s tactics to get famous (let me know if you’re interested in learning how corrupt Google search is.) Without question, what has helped Google Chrome become the most used web browser in the world is the fact that Google owns it. The Mountain View tech giant owns Android and is the default web browser for all devices that don’t choose to change it. Google also owns the Google search engine and puts a pop-up when people visit Google asking if they’d like to install Chrome. On top of that cheeky little pop-up that annoys users, Google also owns YouTube which applies a similar tactic of banner notification asking if people would like to install Google Chrome. You might be able to use YouTube and Google search for ten or so times before you decide to do what it takes to get rid of that pop: biting the bullet and installing Chrome. Some might argue that Google Chrome is the world’s most used web browser purely because of its brilliance in being able to be a better web browser. They would be wrong. If a website like TechCrunch didn’t advertise on Facebook and spend lots of money on advertising on Facebook, it wouldn’t have nearly as many Facebook fans as it does today. People don’t just go around liking things on Facebook—it’s success is based on very cleverly orchestrated advertising tactics. It’s no different with web browsers either. So if a web browser that only has about 12% of the market share isn’t advertising itself to more users like something along the lines of Google Chrome which self-advertises to an incredible amount of people around the world every day, does that mean it isn’t a good web browser? The answer to that question would be no: it doesn’t mean that it isn’t a good web browser. It might even be great. Microsoft claims that Microsoft Edge is a safer web browser to use than its competitors, specifically Mozilla Firefox and Google Chrome. NSS Labs wrote a report that Edge was the safer web browser to use, blocking out more malware than any other. NSS Labs conducted a report where they tested 304 examples of SEM (Socially Engineered Malware) and phishing pages. The results came back with Edge’s SmartScreen blocked a whopping 99% of the samples, while Google Chrome only 85% and Mozilla Firefox 78% of samples. If you had installed Windows 10 somewhere between 6 months and a year ago, you might have noticed a pop-up message above the Microsoft Edge browser icon in the taskbar alerting you to the fact that Edge is faster than Chrome when used with Windows 10. We’ve seen quite a few software updates in Windows 10 since then, and perhaps Google Chrome has made changes since then as well. 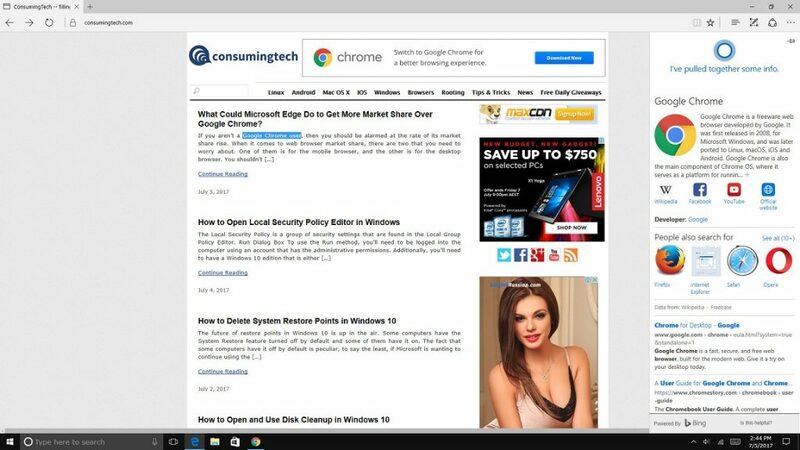 But when browsing ConsumingTech.com without any browser extensions active on both browsers, Edge does load it quicker, and it’s an impressive sight. Don’t believe that Microsoft Edge gets more out of your battery than its competitors? You might want to read this article by Microsoft that makes the claims themselves from their official website, and they have the statistics to back it up. Claimed statistics are one thing, and everyday usage in the real world is another. The battery consumption is noticeably better when using Edge over Chrome on my Surface Book device, and I try to use Edge as much as I can because of that reason when I need to rely on battery power. 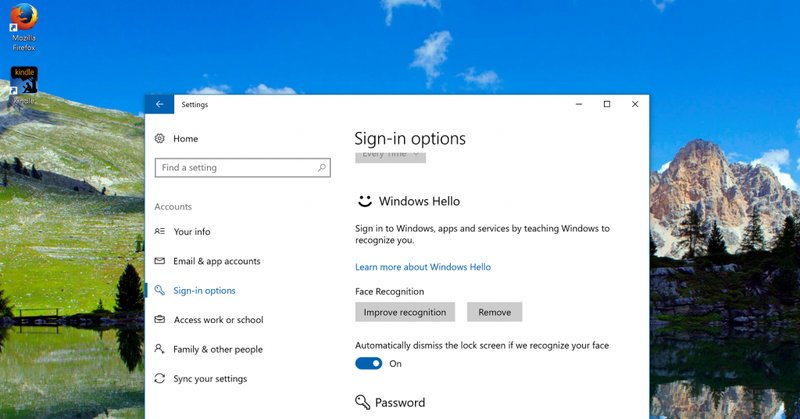 You can use facial recognition and fingerprint scanning technology if you have a device that supports it when you use the Microsoft Edge web browser. The technology needs decent hardware for it to work, so mostly high-end devices only have it available at the moment. Nonetheless, if you do have something like a Surface Book or a Surface laptop, then you might be interested in using Edge purely so you can sign into things a lot quicker and conveniently than even a password manager can. The beginning of virtual assistants accompanying us when online has already started, and Microsoft’s answer to competitors like Siri is Cortana. Some people refuse to talk to technology while others have understood the upside of saying a few words to get an answer. Having to talk will never be a great solution because it can disrupt others around you, but there’s definitely some place for virtual assistants moving forward. Like operating systems, you might prefer getting to know just the one virtual assistant instead of somewhat knowing them all. You’ll probably get a better experience that way. Recent Cortana updates have her able to understand speech a lot better than she could in the earlier days, but there will still be some differences in ability between voice assistants and you’ll take some time to adapt to them. The good thing about Windows owning Cortana is that you also get Cortana integration with the Microsoft Edge web browser as well. We wouldn’t say Microsoft nailed it with the Edge browser. There are still some things are that pretty annoying about it. The icon in the top left corner that shows you if a webpage is still loading or not is a good idea, but it also distorts the first-time bite of a site as well. The fonts also look similar to how they looked from Internet Explorer instead of a really clean look that Google Chrome offers. Some people may like that; others won’t. But overall, we think Microsoft Edge has incredible upside if you should choose to use it. We are starting to use it more as time goes on and might start using it for everything if it continues to offer advantages like the ones mentioned above. Our guess is that it probably will once Microsoft starts to try to take back what once theirs and become the owners of the world’s most used web browser again. They still own the most used operating system, so the ball is in their court.